Legend says of an race of feral orks who, using rare plants and exotic fungii, perfected the art of extracting the purest of Goatronium from rawest of goatcake…. And so it was that, in investigation of this tale, Chaos and Orkish armies landed upon the temperate world of Harj Kitari in hopes of discovering whatever secrets its greenskin inhabitants might possess. Before they could fight each other, however, a new threat appeared: a massive expeditionary force of Tyranids, clearly seeking the same secret. The two enemies decided to temporarily join forces against this new xenomorphic foe. Orks (1,500 points) and Chaos (1,500 points) against Tyranids (3,000 points). The renowned Orkish witch doctor Ivag Ooddazeekret has taken refuge in the central watchtower. He is worth two objective points. He will remain in the tower unless it is destroyed (AV12), at which point he will move 2d6 randomly each turn if not controlled by a player. The other objectives (1 point each) are three orkish huts, two to the west and one to the east. The Orkish commander drew back a deep breath as he looked at the seemingly endless hordes of Tyranids confronting the allies. After a quick consultation with the Demon Prince, they decided on a simple plan: the Orks would charge headline into the fray and tie down several of the six (!) 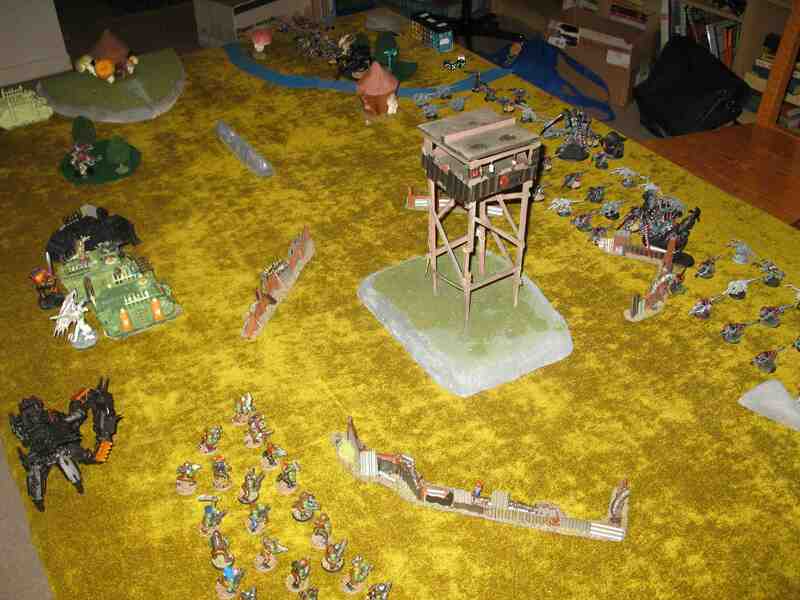 Carnifexes facing them, while Chaos would concentrate on seizing the watchtower and western huts. Allied fighting killed many ‘gaunts and quite a few genestealers when, suddenly, three Orkish truckers raced forward and disgorged their loads of Meganobz and choppa Boyz. These went after a couple of ‘fexes and a unit of genestealers, killing a fex in the process. However, the Tyranids counterattacked, destroying the squads. With this, a massive unit of dakka Boyz entered the fray, shooting down one ‘fex before engaging a second in fierce hand-to-hand combat. Meanwhile, despite one Chaos squad falling prey to genestealers, the others advanced to their objectives as planned–the Rhinos proving remarkably resilient to enemy hits. Finally, Ivag Ooddazeekret was “rescued” by the Chaos Marines and one hut secured, while a single Nob–the sole survivor of more than fifty Boyz–held off a Carnifex.